There is an enchanting place tucked away into Germany's most south-eastern tip. Just a fast 2-hour drive from Munich, through rolling hills and cute villages, lies the Berchtesgadener Land. This unassuming place, and its people, is like the gorgeous girl next door who doesn't know how beautiful she is. And not that the people who grew up here (my father included) don't appreciate its beauty, with mountains greeting them each morning, guiding them to and from school, it's that they are too busy living the grandest outdoor lives...come snow, come sun. 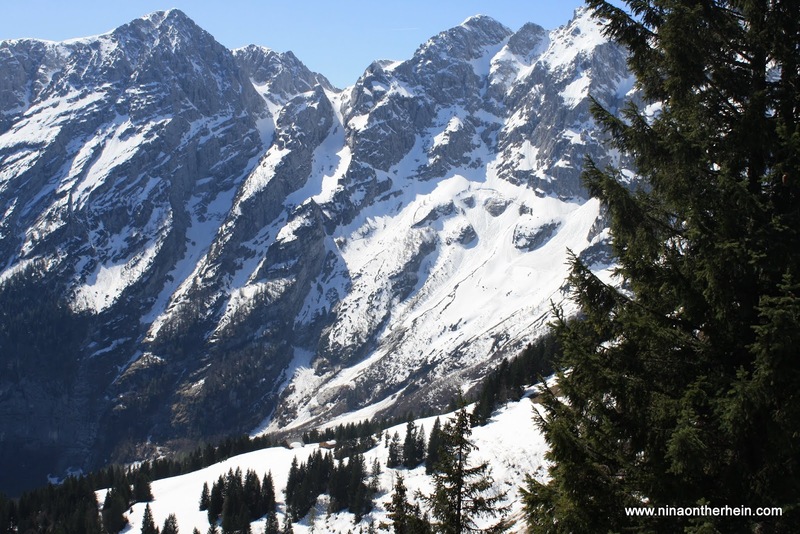 Bordering Austria, the line between the two countries is barely noticeable through mountaintops and forest trees. 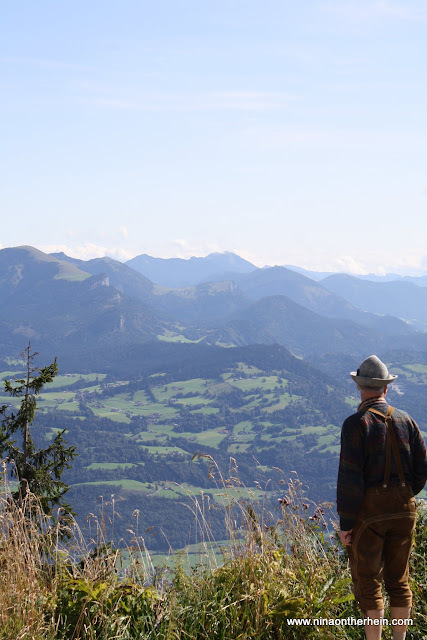 Amongst these alpine villages nobody much cares about the politics of a borderline. This is the perfect place for solitude, the purest air, and good, clean hiking fun. 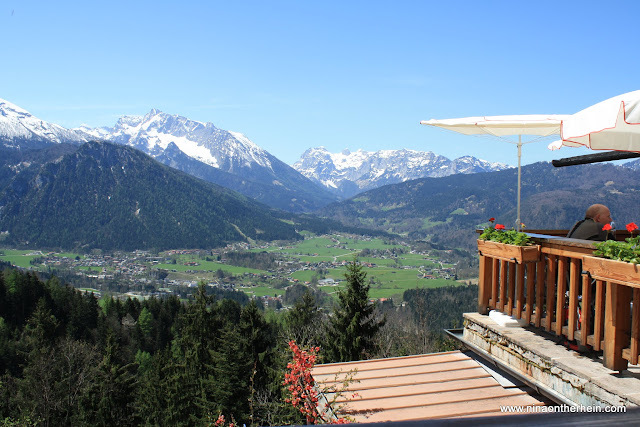 In the spring, the snow's retreat leaves the greenest alpine pastures and cosiest mountain huts laying out their welcome mats. 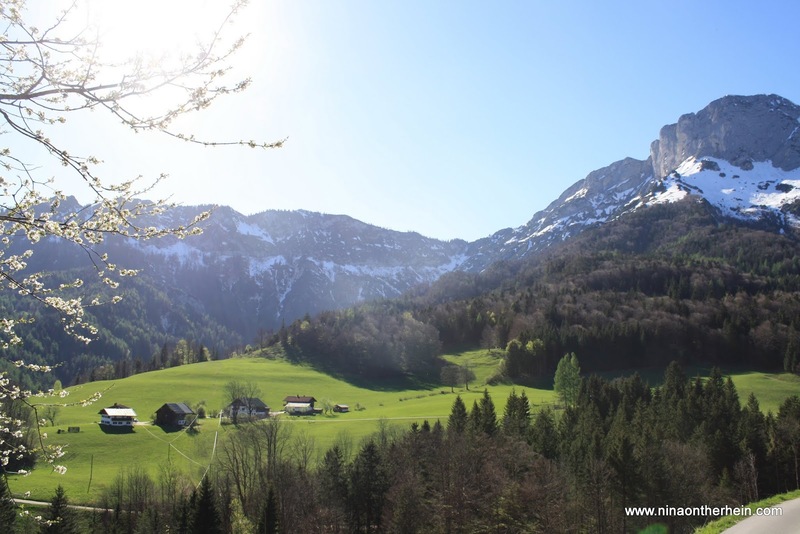 Berchtesgaden is just 30 minutes away from Salzburg, which along with the numerous historical and tradition-rich sights in the area, will leave even the non-hikers with plenty to do. There is a real personable quality that the Bavarian mountain folk have...possibly it's found in all mountain folk. Doors are open, coffee invitations are freely given, and hard work and hard play is as routine and ordinary as the German train timetable. 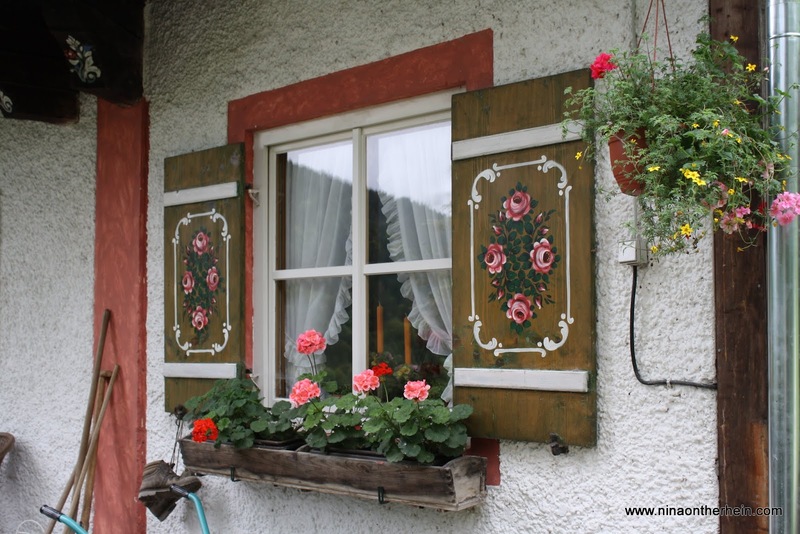 But, since this is still Germany, everything is spotless...homes, farms, fields and gardens are immaculately cared for, with traditional touches, making it all oh so pretty. Home town girl...my aunt leading the way. With a national park covering more than 200 square kilometres, and mountains towering towards 2500 metres, your wandering opportunities are endless. 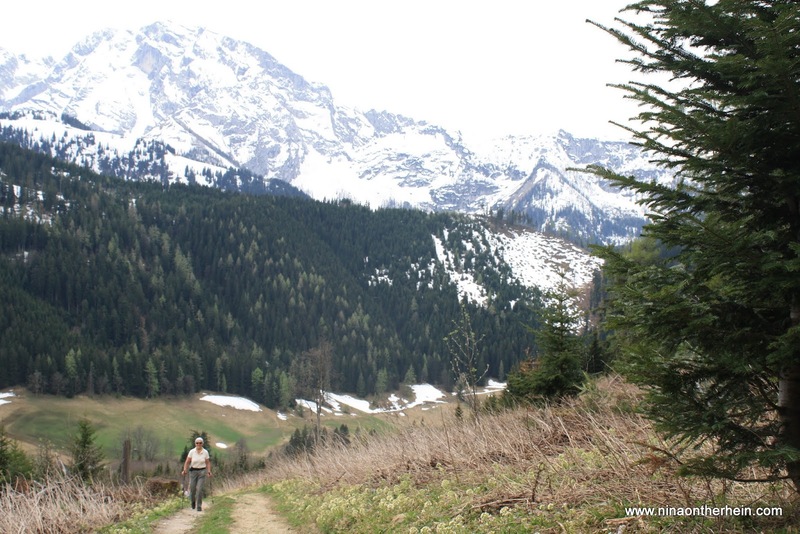 Your best bet is to visit the tourist information and get a hiking map to plan out your day tours. 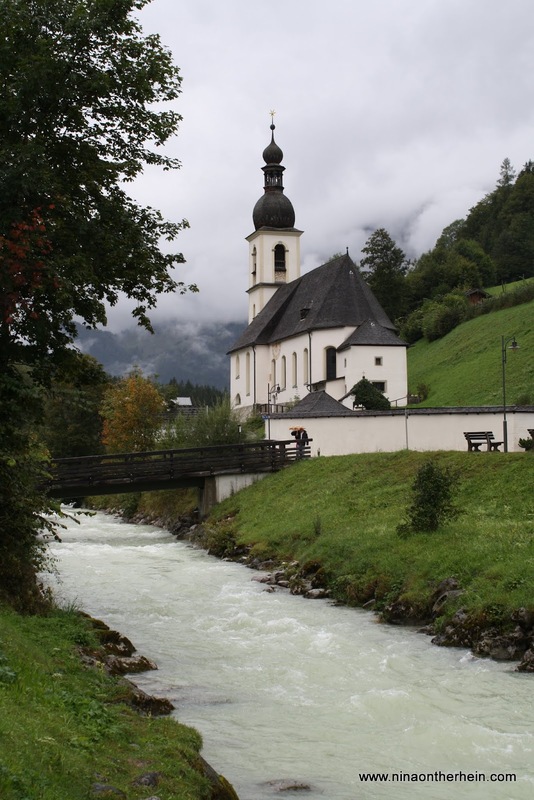 One excellent tour close to Berchtesgaden is through the Almbach Klamm (ravine). When you come out on top you are greeted with this sight - the 'Maria Heimsuchung' (Maria searching for home) Church. It's well worth the climb. 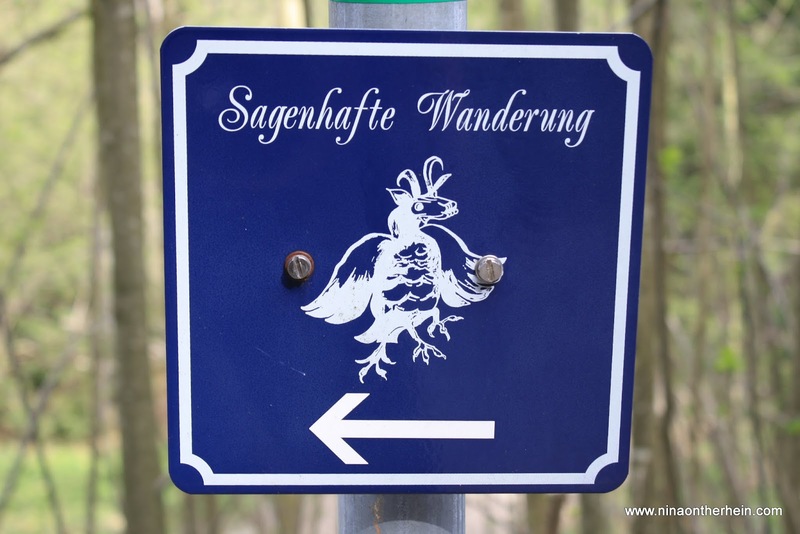 In Germany, the hiking (wandering) trails almost always lead through farmer's pastures, which I love. 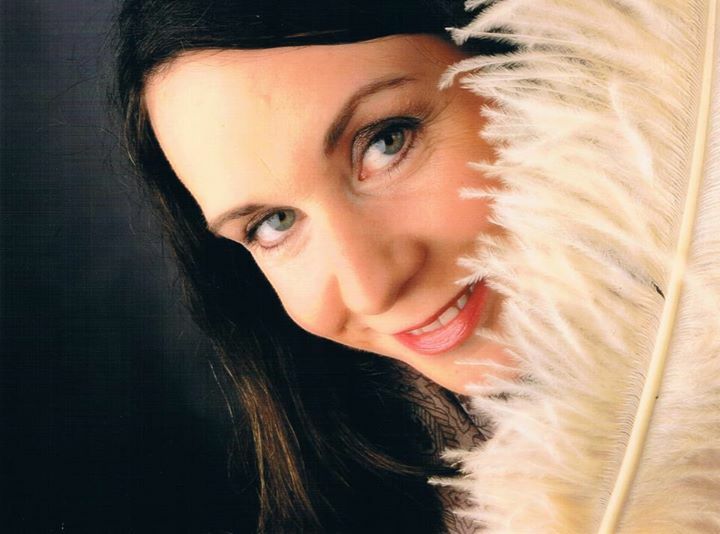 It brings you up close and personal to people's lives without being intrusive. And at the top of basically every mountain top or alpine meadow you will surely find a gastwirtschaft (a small pub)...for a drink or two. 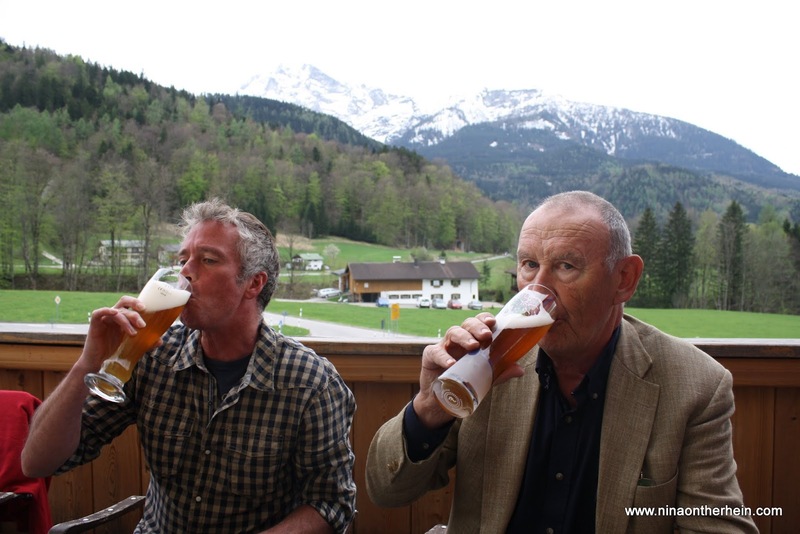 A weizen bier or a radler (beer with lemonade) will be the best thing you'll have ever tasted. Trust me. Delicious. A meal in itself. Ahh...these two clowns. My bf and pa. The alpine roads here, while treacherous during some times of the year, provide the most incredible scenery. 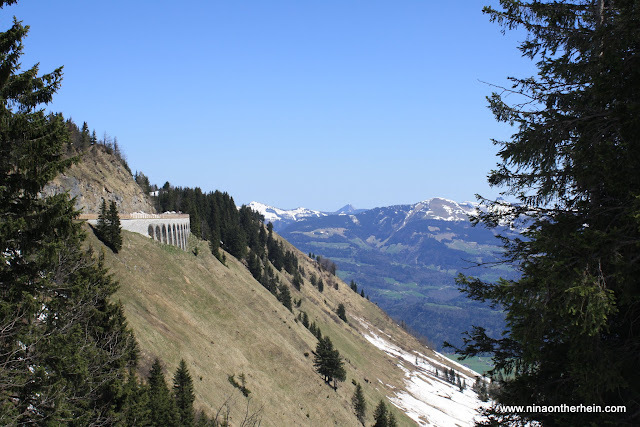 The Rossfeld Panorama Strasse (Road), is the highest continuous road in Germany. Before WWII took over my grandfather's life, he was one of the civil engineers on the building team. Pack a picnic and take a little road trip through the mountains...stopping whenever you want. I like springtime here the best, because it's warm enough to wander without a jacket, but snow still lays out like it's enjoying its last days of vacation before going home for the summer. The town of Berchtesgaden is shadowed by the Watzmann, Germany's 3rd hightest mountain. In the winter skiers flood the villages, and in the summer, skis are replaced by carabiners and climbing ropes. 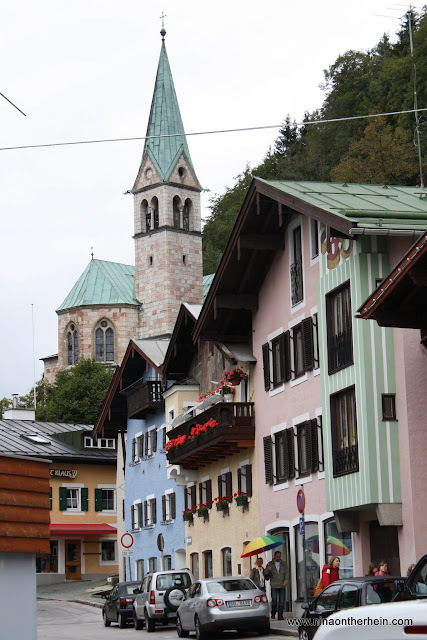 But aside from the impressive outdoor activities it supports, Berchtesgaden is also an incredibly picturesque town. 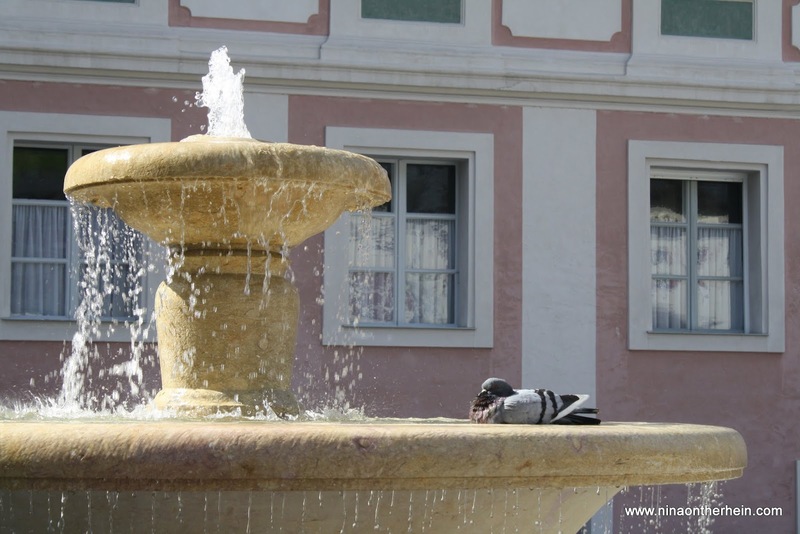 The Schlossplatz (palace square) is surrounded by the pale pink walls of the palace. Houses are painted in all shades of pastel, while overflowing flower boxes sag under the weight of bright geraniums hanging from almost every window. Traditional Bavarian folk painting adorns houses, often telling opulent, dramatic stories. 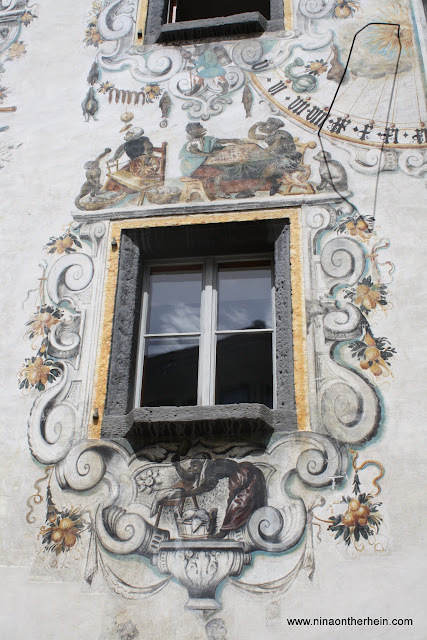 I tried to figure out the meaning of the series of pictures on the house below, but art is sometimes difficult to decipher. I would hazard a guess that it's a parody...turning things as they are, upside down. Or it might be a very politically-incorrect statement piece. Or it just might be pretty. 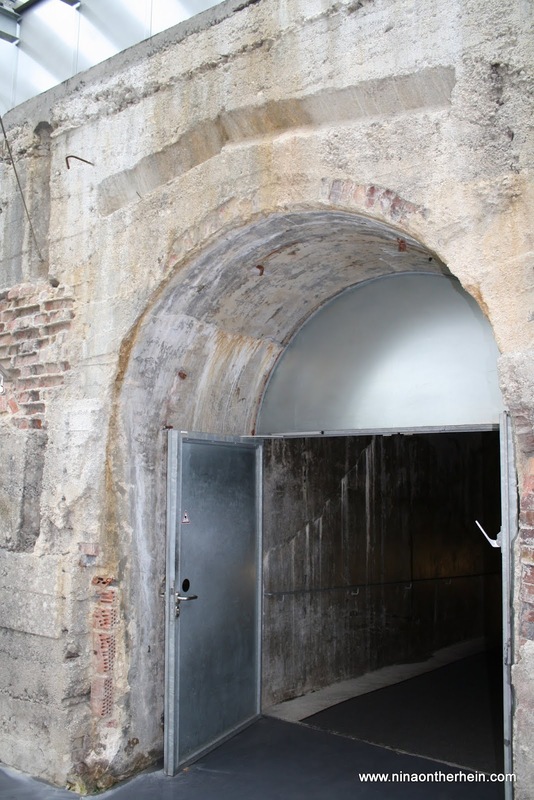 This area brims with WWII history. 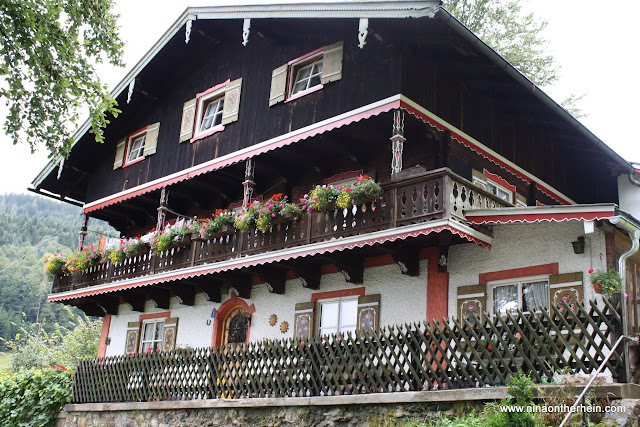 Hitler loved the Berchtesgadener Land and spent a lot of time on the mountainside above Berchtesgaden. He built his Eagle's Nest here, strategized with his cronies here in his Berghof, and his SS troups had a large camp here. Now, there is a very detailed documentation centre on the Obersalzberg - a kind of museum to all that went down in this area. It's hard to take in at times, but really important to do. You can even enter the massive bunker system. 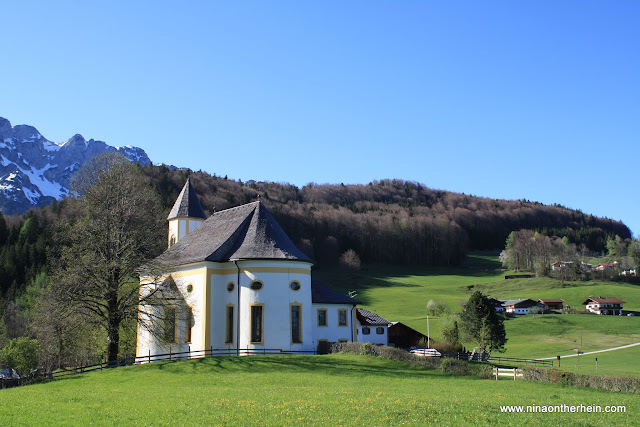 One of the most photographed Bavarian scenes, the St. Sebastian Church of Ramsau, is found 20 minutes east of Berchtesgaden. You need to stop, take a photo, and take a breath. Also, take a walk through the cemetary gardens behind the church...it's like no cemetary you'll find in North America. 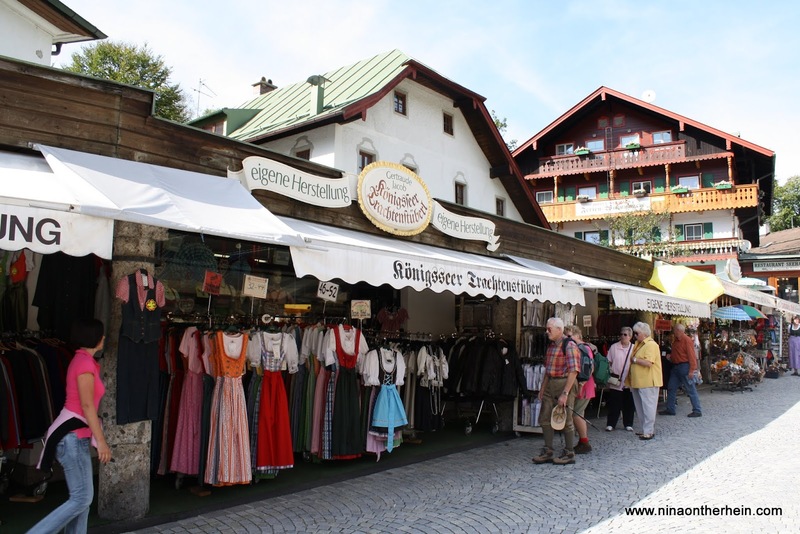 Königssee is filled with tourists, many of whom stop to buy (or at least try on) a traditional dirndl or lederhosen. I didn't buy mine here, but trust me when I say, a dirndl is one comfortable dress! 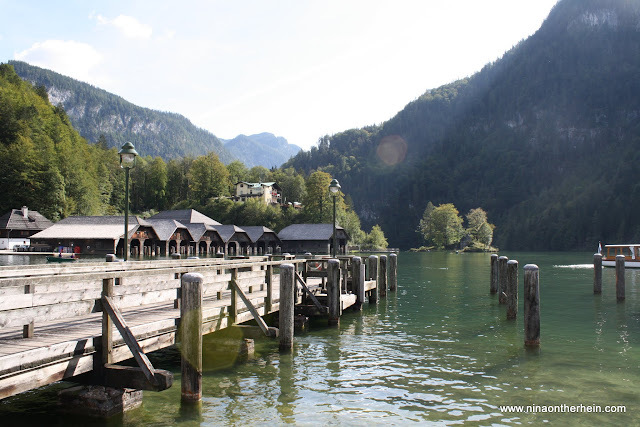 A very deep, natural mountain lake, Königssee is very popular with hikers and daytrippers. Boat cruises, waterfalls, an island church and many watering holes in the village entertain young and old easily. 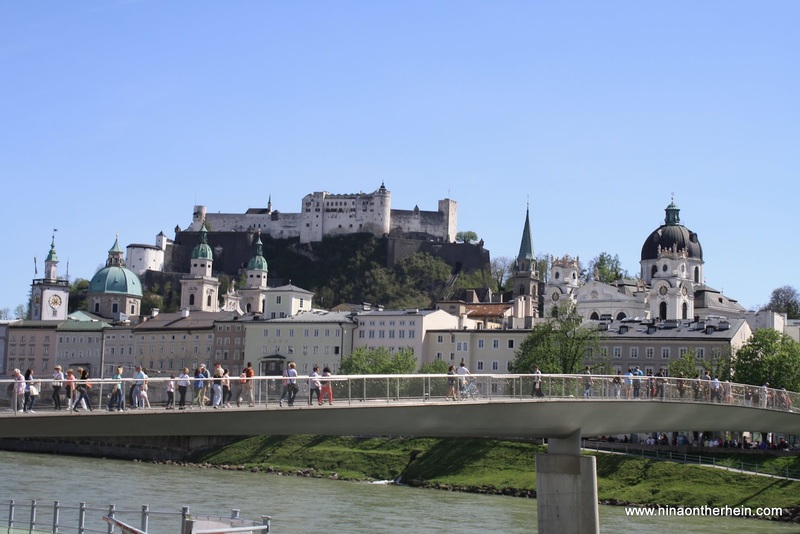 Directly 25 km north of Berchtesgaden, but on the Austrian side, is the incredible city of Salzburg. With an impressive white burg (castle) as its central focal point, the touring of historical monuments (ie. Mozart's house) around the town centre will easily fill a good part of the day. The baroque Salzburger Dom is right below the castle walls and well worth a pop inside. 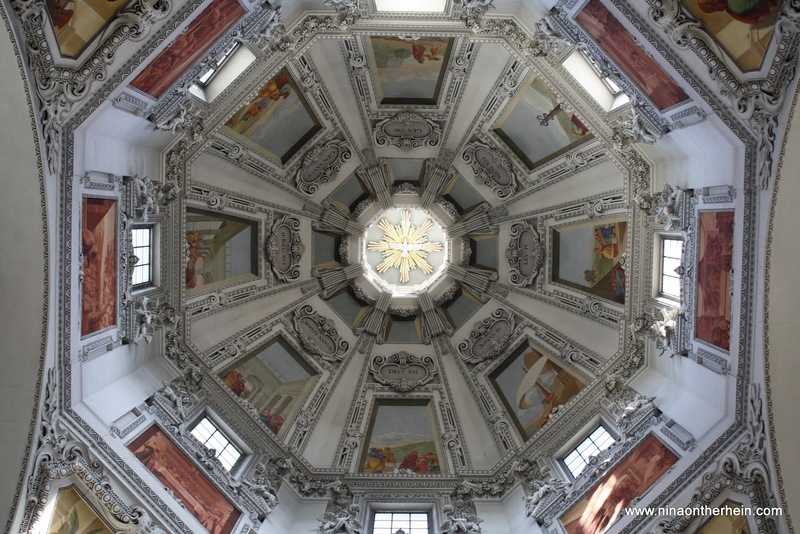 Built in the 17th century, its ceiling is magnificent, with the most incredible detail. 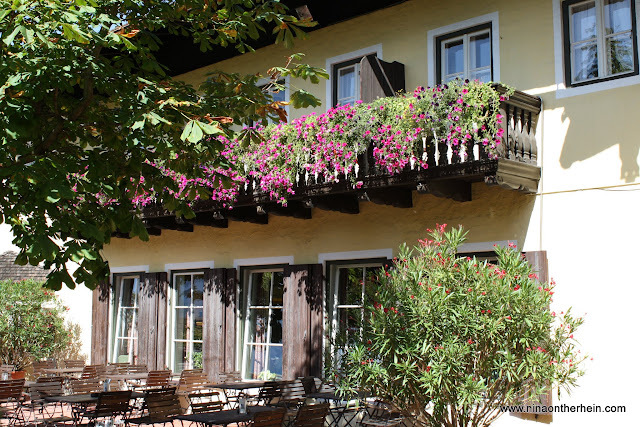 But, my favourite part of Salzburg (it's not the Sound of Music tour - which I've never been on), is the horse well (Pferdeschwemmer) located in the Altstadt (old town). Every time I'm in this city, I make for this gorgeous piece of art. The huge frescos were painted in 1732 by Josef Ebner, and the central statue created by Michael Mandl. 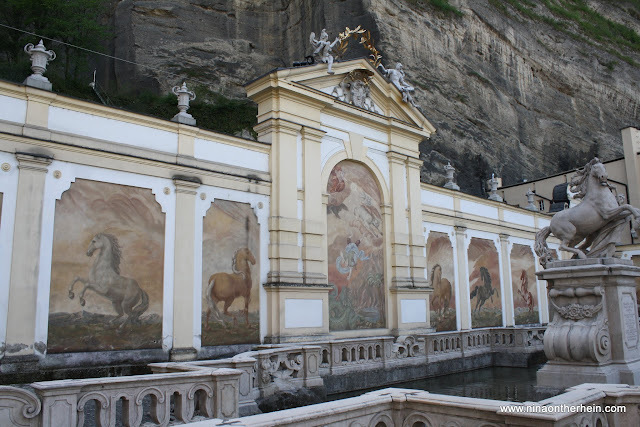 Back in the day, the Austrian prince stabled his horses here, but now it's all just for show. A perfect show in my opinion. Planning a long weekend, or a long trip, to this small corner of the world is a treat. You won't be disappointed. I'm already planning my next trip...this time in fall! Servus!